Your one-stop-shop for portable exhibition display stands, banner stands and graphics. We will not be beaten on price! 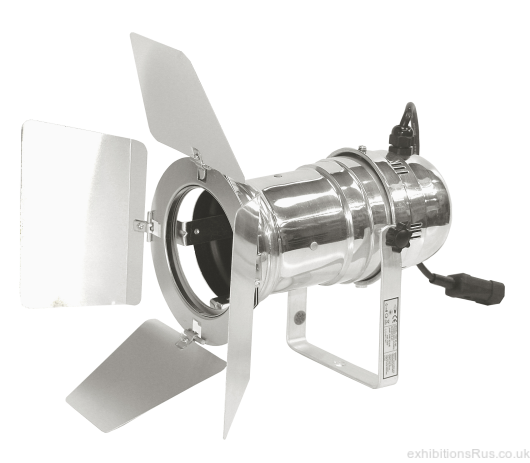 ThE GL100 is a stylish exhibition and display light unit, Unit measures 260mm long, it comes fitted with and LED lamp the 9W LED lamps gives 900 lumens with 30 degree angle, the long hood will reduce this down to approx 20 degrees. A 14w Led bulb 27ooK now supplies more light output than the traditional 100 Watt Halogen bulb. Use of these lights adds show atmosphere and provides a balanced light. When comparing halogen to LED it should be noted that a halogen lamp life is normally expected to be 2500 hours which sounds allot and is a substantial improvement from the tungsten lamps, however an LED lamp should be ok for 30,000 hours, thats 12 times extra life span. Considering the lamps also offer a power saving up to 90% the extra investment is money very well spent. Exhibition staff and visitors will appreciate a reduction of heat burning down at trade shows from lighting, it has always been a tiring burden but no more! 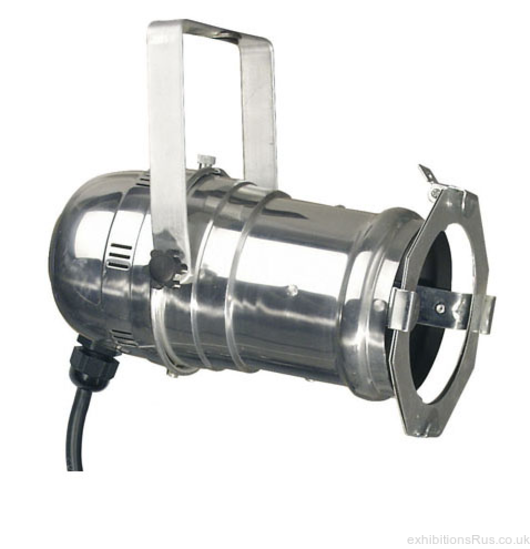 This stage light, comes with 9w LED lamp. Very theatrical styling particularly with the barn doors which are mainly for show, very popular on exhibition gantry and truss systems. (barn doors + £15 see image below). The unit comes with a short mains lead of 250mm, a daisy plug option is available and this is perfect for use with our exhibition lighting truss systems, the units can be positioned on the truss before the stand is hoisted or mounted on its legs the daisy plug and play lighting system will allow multiple lights on one cable run, it is important not to overload a circuit but, with the use of LED lamps its hard to go wrong. The led colour output is 2700 K which is warm white for clothing or similar products however the unit incorporates a gell filter holder and so the light balance can easily be whatever you need, please speak to us we are happy to help with your selection. Overall a cost effective solution for exhibition halls and showrooms. Various clamp options offered. A popular light for gantry and truss systems. Weight 1kg.